For the people that know about Raspberries and the Pi-Hole project. 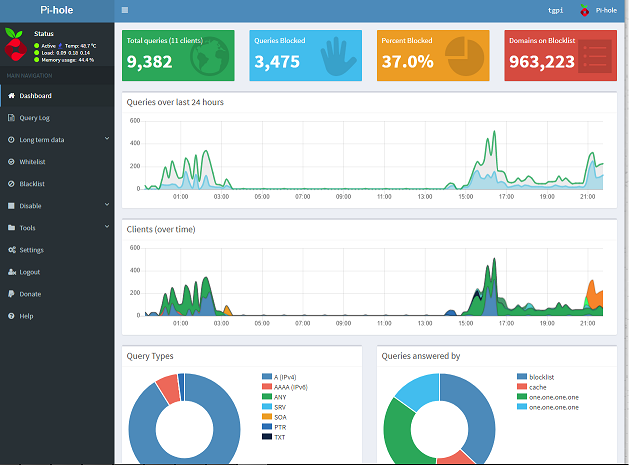 Recently setted up PiHole on my old RPI1 which i had laying around. Works perfectly as DNS server so all ads on all clients are blocked. Unfortunatly Youtube keeps pushing some ads on the homepage and beginning of videos. This is ofcourse easy solve-able with the famous addon uBlock Origin. But hey, i dont have this PiHole config for nothing right?! Goal is to have everything blocked without using third-party extensions. Went on the search for adding extra blocklists. It appears Youtube keeps pushing ads through server addresses which are spoofed so not really easy to add in a blocklist. Does anybody has experience with blocklists esp for Youtube? Last edited by iSenSe on Sat Dec 29, 2018 9:52 pm, edited 1 time in total. You want to block advertising on Youtube? papercoffee wrote: You want to block advertising on Youtube? yes, with the use of blocklists, without using ublock. NoScript and µBlock Origin does a very good job. I just got reminded by your post that there are ads on Youtube. How can people without those two extensions surf the internet and stay sane?!! papercoffee wrote: NoScript and µBlock Origin does a very good job. Without any extensions i say Paper. I've disabled my extensions and all sites are clean. Only Youtube seems to sneak ads through spoofing addresses. I'm a youtube watcher from time to time and using my Phone because... it's faster than all my computers at once, LOL. A smarty dev is mirroring phone's screen on a TV/Monitor. What's exactly the main advantage ? I'm using some tweaked YouTube without adds, I did not see any add-on for months, not the last thing, there are several apps creating an internal VPN filtering adds properly like AddBlock does, my phone last time was clean like crystal and I can watch videos and do my jobs without to be annoyed - even web-sites are filtered, they do look clean. I could not manage to root it, but right now I see that I don't even need that - it's a default risk here. I'm an advertising hater, not a single time I forgot what I was looking for because of some annoying crap running in front of my eyes and which I never asked and neither interested - amazingly running for some seconds before to see some closing option popping up. That's why I did a small research around... If you want to find more details we can debate a few names in PM because reading a public forum is doable by any entity and I don't want "connections". Everything is working in my life. I don't need to actually ''debate''. PiHole extends my life in the world of ad blocking enormously, esp cause i got a lot of friends on my (W)Lan. uBlock for youtube and iam done. All the things you describe (cookiewalls and such) Pihole blocks them beautifully, on all my devices. I saw indeed some modifications that can be done through the hosts file, only for youtube. Apparently Youtube keeps changing their URL g-243.doubleclick.google.ads.net every 14 days or so, so it will be alot of manual work keep updating that hosts file. But, I'll drop an eye at this PiHole to see what is about... Information appreciated.